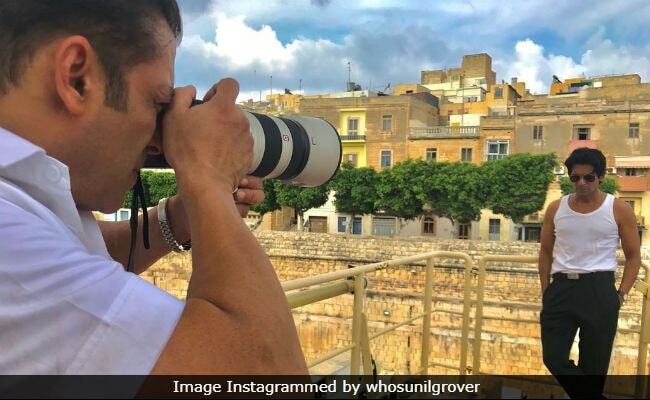 Comedian-turned actor Sunil Grover, who is currently shooting in Malta for his forthcoming film Bharat, shared a picture from the sets of the film and it had us hooked. Why, you ask? Well, the reason could be attributed to Sunil's "photographer" in the picture. Did we mention that the photographer we are talking about is none other than Salman Khan? Yes! On Friday, Sunil shared a picture on his Instagram, in which Salman appears to be clicking Sunil's photograph as the comedian poses in a balcony. Sunil described the photo in his signature style and wrote: "Ahem ahem... posting the final pictures as they come. Don't keep looking at the photographer only! BTW location is Malta, shooting for the film Bharat. The picture shared by Sunil Grover appears to be quite similar to the one that was shared by Salman Khan a few days back. Salman captioned the post: "Acchi photo khichne ke liye bahut focus karna padta hai. Actually true for everything in life." The picture received over 9 lakh likes on Instagram. Salman Khan is frequently seen sharing pictures from the sets of Bharat on his Instagram account. Last week the 52-year-old actor shared pictures and videos from the streets of Malta. Bharat is the Hindi adaptation of the South Korean film Ode To My Father. The film also features Katrina Kaif, Disha Patani, Tabu and Nora Fatehi in pivotal roles. Salman Khan will be seen playing the role of a daredevil stunt motorcyclist in the film. Directed by Ali Abbas Zafar, Bharatis slated to release on Eid next year.